Kids, here are some links to other webpages that you might find interesting. From fun crafts to silly jokes to mind-boggling science, adventure is just a mouse-click away! Before you go, make sure you know a few simple rules to be a Safe Kid on the Internet. Defenders of Wildlife: Find out how you can help protect the animals and plants. The Froggy Page: All kinds of virtual frogginess, from the silly to the scientific. National Wildlife Federation's KidZone: NWF has animal info for all ages. What's That Snake? : Identification, facts, myths, and more about snakes! @rt Junction: Inspiration and ideas to help you create your masterpiece. Artsonia: The World's Largest Kids' Art Museum! Coloring.com: Lots of pictures available to color and e-mail or print! First Palette: Free kids' crafts, art activities, and printables designed to nurture creativity and the love for learning. Snowflakes: Instructions for making paper snowflakes. Spare the Rock: Cool music for kids that adults will like, too! A Book and a Hug: Browse book reviews by subject or age level. Dav Pilkey: Warning! May be too silly for Grownups! Frank Asch: Have you read Mr. Maxwell's Mouse? 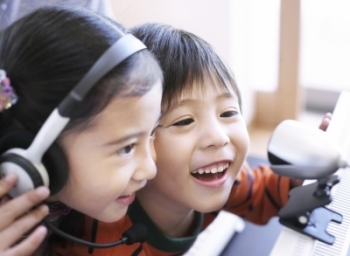 International Children's Digital Library: A Library for the World's Children. Jan Brett's Home Page: 2,771 pages of free activities, coloring pages, and projects. Kate DiCamillo: The author of Because of Winn-Dixie and The Tale of Despereaux talks about her books and becoming a writer. Kids, Know Your Rights: A Young Person's Guide to Intellectual Freedom, a brochure from the American Library Association for 5th graders and up, explaining intellectual freedom, kids' rights under the First Amendment, and the meaning of censorship. Know your rights! Margaret Palatini: A website of the author of Zak's Lunch, Stinky Smelly Feet, and lots of other silly tales. Sneak peeks of new books and fun activities for you! Seussville: "If you never did, you should. These things are fun, and these things are good." StoryPlace: Interactive stories on-line for pre-schoolers and elementary kids. Word Central: Online dictionary and activity center from Merriam-Webster. Apple Corps: Give an apple (or carrot, or artichoke) a face and dress it up! Boston Children's Museum: 100 ways to play! Center for Game Science: scientific discovery games, games that discover optimal learning pathways for STEM education, cognitive skill training games, games that promote human creativity, games that explore collective over individual intelligence, and many more! Fake Out! Try to guess the right definition for a word, then write one of your own. Five Field Kono: A simple strategy game similar to Chinese checkers. Goobo: Build a monster or a rocket, make a space scene or...listen to a belch??? Hamsters!! Take the 10-Minute Bedtime Tour. Powered by Hamsters! Jokes at AZKids.net: Jokes, riddles, brain teasers, and more. Orisinal: Morning Sunshine: A website full of games and treats that is both fun and beautiful, created by web artist Ferry Halim. Requires Flash. Prongo.com: Jokes, games, and a lot more! Library of Congress: Resources for kids and families. Great Websites for Kids: Great Web Sites for children, parents and caregivers, sponsored by the Association for Library Service to Children. Smithsonian for Kids: Art, science, people, history: this site has everything! PBS Kids: Games, stories and activities from some of your favorite characters. Exploratorium: Explore the world of science at this really cool website! Ask Dr. Universe: The world's most curious cat! Download a dinosaur: Easy-to-make paper dinosaurs for you to download and print. Be an Inventor! The U.S. Patents and Trademark Office has a site just for kids! Magic School Bus: Join Ms. Frizzle and the gang on a field trip. The Why Files: The science behind the news. Grossology: The science of really gross things. Biblioteca Digital Internacional para Niños: La misión de la Fundación ICDL es entusiasmar e inspirar a los niños del mundo para que se conviertan en miembros de la comunidad global. Way Cool Running: Everything you need to know about running. Games Kids Play: Rules for playground games, verses for jump-rope rhymes, and more! Sports Illustrated Kids: The online version of the sports magazine just for you!